Newcastle United are not quite where Alan Pardew wants them to be. They are, however, close. Really close. There has been far more good than bad this season from Newcastle’s players. Even the most malcontent of supporter would be forced to admit as such. Pardew even sees similarities between this side and the one which finished fifth. There is, however, one difference. The team of two seasons ago didn’t tend to slip up in games such as tomorrow’s home meeting with a Norwich City side who have hardly been pulling up trees. Beating Chelsea, Tottenham and then losing or drawing against a struggling team is a very Newcastle thing to do. So Pardew would like to buck the trend. Starting with this weekend. “That season of two years ago, we used to see off these games at home and that’s what this team needs to try and replicate. That season, we did not let many games slip out of our hands. “But even then we had games that got away from us, which can happen in the Premier League. The most important thing is you bring your best games most week and I think we have done that, which is reflected in our points total. “We need to do that against Norwich and, if we do, we’ll find ourselves in a good position. “We’re not quite there (the form of two season ago) yet because we have had hiccups that maybe that team wouldn’t have made. The Hull game in particular, and against Sunderland where at the very worse we should have got a draw. “But we’re showing good signs, there is a lot of young players in the team, a lot of energy and really good team spirit. “We are playing with a smile on our face which is really important at a big club like this.” Pardew conceded that his fear was that the team could let themselves down after doing so well of late. Six points from encounters with two would-be Champions League sides is some going. The last thing he wants is for that good work to be undone. 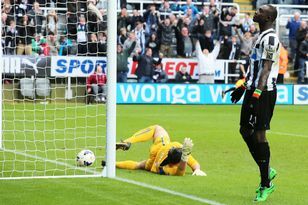 Pardew said: “We could get into a position where we could really affect the top and then lose this game. Then it would difficult to get that momentum again. “We’ve got momentum with us after Chelsea and Tottenham. “This match is more important in some ways and I’ve been reminding my staff all week how important it is, and when the players get back, that we focus their minds on Norwich. “We’ve got ourselves in a poised position, and we need to capitalise on that. That’s something that we’ve not done so well in the last 18 months. “Go back two years, and we were capitalising on these positions. “The message we need to bring home is that with a win against Norwich we put ourselves right in the mix. “Any team can beat anyone in the Premier League this season, but for us this is a great opportunity and they don’t come round that often. “It’s a game that if we get ourself in a good place with 50,000 behind us that’s going to make a big advantage and we need to make sure we carry that through.